Place your favorite holiday portraits or photos with Santa in our traditional photo holder. • Our Santa cards are sturdy cardboard stock with glossy full color covers. • Slide your family portrait or corporate event photos inside a folder. • Sold here in cases of 100 photo folders. Place your favorite holiday portraits or photos with Santa in our traditional photo holder. 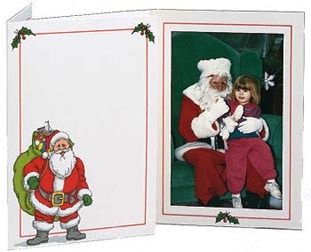 Santa cards are sturdy cardboard stock with glossy color covers. Perfect family portrait or corporate event photos presentations.